Combine the convenience of a motion sensor with the functional ambiance of a dimmer with Lutron's Maestro Occupancy Sensor Dimmer. The latest innovation in Lutron's beloved collection of Maestro lighting controls, this combination dimmer and sensor switch turns the lights on and off for you and allows you to dim to your favorite level. It's a simple, easy and low cost way to save energy and add light automation to your home. The dimmer works just like a Lutron Maestro dimmer, gradually turning lights on and off, allowing your eyes to adjust to the new light level. Use the rocker to adjust the light level for any activity, or set the preset level to ensure lights always turn on to your desired light level. Equipped with ambient light detection, you can customize your sensor dimmer to detect daylight so lights don't turn on with enough natural light in your room. Keeping the sleek design of the Maestro family, Lutron sensors will match the décor of any room in your home. Install it in the laundry room for added convenience when your hands are full, or in the kids' rooms and never worry about lights being left on by mistake. Maestro Occupancy Sensor Dimmers work with any dimmable bulb type, including dimmable CFLs and dimmable LEDs as well as the common incandescent and halogen bulbs. 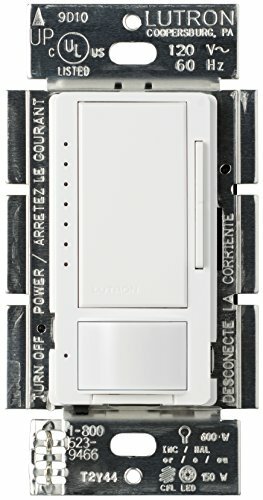 This occupancy sensing dimmer can also be easily programmed to function as a vacancy (manual-on) sensor dimmer as well, perfect for use in bedrooms or kid's rooms.